Congenital heart diseases, such as tetralogy of fallot (TOF), are the most common human birth defects that may cause pulmonary diseases. 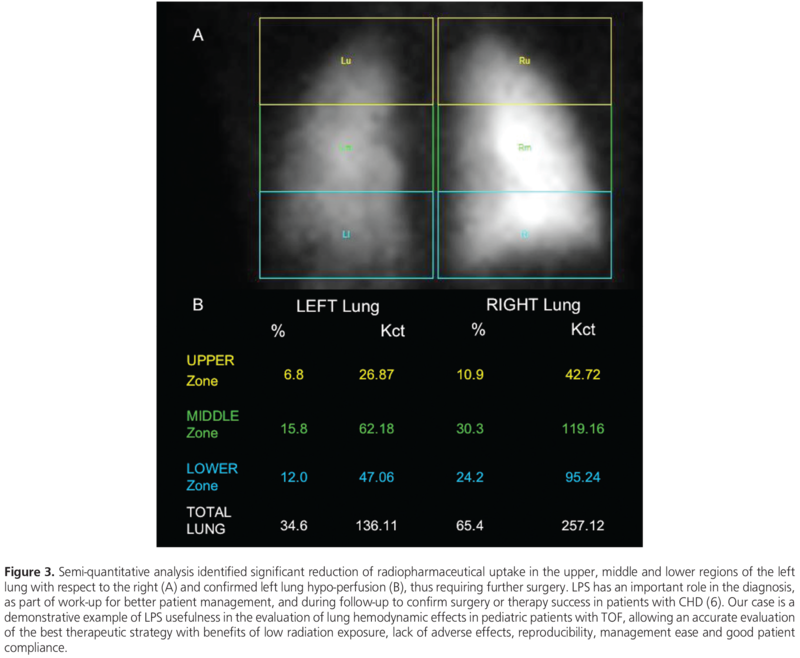 Lung perfusion scintigraphy (LPS) has an important role in evaluating pulmonary involvement in patients with these defects, both as part of the diagnostic work-up and for follow-up to guide best therapeutic strategy. Herein, we report a 10-year-old female patient with TOF who underwent LPS two years after cardiac surgery. The scan showed hypo-perfusion of the left respect to the right lung and abnormal uptake of Tc-99m-macroaggregated albumin in the kidneys and spleen, revealing the presence of a right-to-left shunt, and the necessity for further cardiac surgery. This case is a demonstrative example of the usefulness of LPS in patients with TOF, allowing an accurate evaluation of the best therapeutic strategy with the benefits of low radiation exposure, lack of side effects, reproducibility, management ease and good patient compliance. Dino Rubini for graphic support in preparing the figures. Surgical and Medical Practices: A.N.A., G.R., Concept: C.A., A.C., Design: A.C., V.L., Analysis or Interpretation: A.N.A., G.R., Literature Search: A.C., Writing: C.A., A.C.
Hoffman JI, Kaplan S, Liberthson RR. Prevalence of congenital heart disease. Am Heart J 2004;147:425-439. Zeng Z, Zhang H, Liu F, Zhang N. Current diagnosis and treatments for critical congenital heart defects. Exp Ther Med 2016;11:1550-1554. Sun R, Liu M, Lu L, Zheng Y, Zhang P. Congenital heart disease: Causes, diagnosis, symptoms, and treatments. Cell Biochem Biophys 2015;72:857-860. 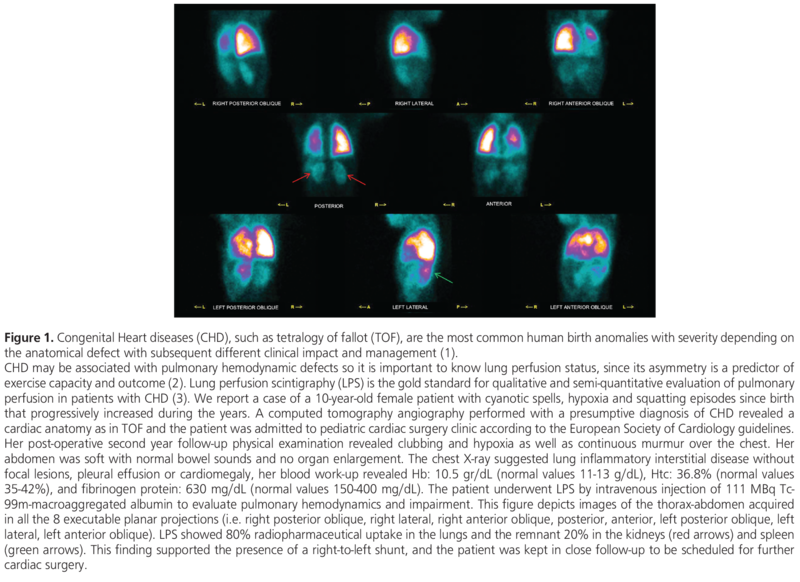 Fathala A. Quantitative Lung Perfusion Scintigraphy in Patient with Congenital Heart Disease. Heart Views 2010;11:109-114. Parker JA, Coleman RE, Grady E, Royal HD, Siegel BA, Stabin MG, Sostman HD, Hilson AJ; Society of Nuclear Medicine. SNM Practice Guideline for Lung Scintigrafy 4.0. J Nucl Med Technol 2012;40:57-65. Niccoli Asabella A, Stabile Ianora AA, Di Palo A, Rubini D, Pisani AR, Ferrari C, Notaristefano A, Rubini G. Lung perfusion scintigraphy in pediatric patients with congenital malformations. Recenti Prog Med 2013;104:442-445.